Women and Popular Music explores the changing role of women musicians and the ways in which their songs resonate in popular culture. Sheila Whiteley begins by examining the counter-culture's reactionary attitudes to women through the lyrics of The Beatles and The Rolling Stones. She explores the ways in which artists like Joplin and Joni Mitchell confronted issues of sexuality and freedom, redefining women's participation in the industry, and assesses the personal cost of their achievements. She considers how stars such as Annie Lennox, Madonna and k.d. lang have confronted issues of gender stereotyping and sexuality, through pop videos for 'Justify My Love' and 'Sweet Dreams (Are Made of This)', and looks at the enduring importance of the singer-songwriter through artists such as Tracey Chapman. Lastly, she assesses the contribution of contemporary artists including Tori Amos, P.J. Harvey and Courtney Love, and asks whether the Spice Girls are just a 'cartoon feminist pop group' or if they provide positive role models for teenage girls. "From many perspectives, this is a judicious and enjoyable book that will attract students, academics, and nonspecialists. 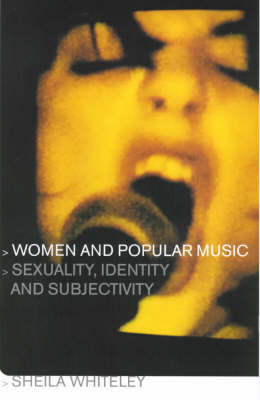 Whiteley's blend of musicology and feminism with a flair for social pragmatism provides a platform for debate that is of significance top popular music studies... it stands as a model for stimulating the ongoing challenge of reading music thorugh textual analysis." "Whiteley's wholehearted enthusiasm shines trhorugh even the toughest critiques of her subjects, and she avoids the all-knowing cooler-than-thou tone that often makes rock criticism (still a predominantly male field) difficult to swallow.."
"This celebration of female musicians will inspire you to give a listen to all of your faves again and may make you fall in love with some music that you've never even heard.."